History: (What If? II#100/2) - When Reed Richards, Sue and Johnny Storm, and Ben Grimm of Earth-97102 went into outer space on an experimental rocket, Sue Storm was knocked into the side of the rocket and went unconscious. When she awoke, she was in a strange land with tiny beings called the Micro Nuts, who told her that she was in the Land of Fuzz. Commander Re-Ran then explained that her ship had crashed into their greatest enemy, Galactic Cuss the Fairly Malicious. When she asked where her friends were, Re-Ran explained that the only things they found in her ship were a few valuables which they hid far from her reach and a mechanical squirrel named Herbie. Before she could even make sense of this new world, her conversation with Re-Ran was interrupted by Youaretoo the Looker, who offered her cake with coconut sprinkles. She agreed to have some cake, but was stopped by Doctor Va-Va-Va-Voom, whom Youaretoo thought was a clown. Va-Va-Va-Voom then announced that he was there for his cousin, Galactic Cuss's invisible sneakers. The invisible sneakers then disappeared from Galactic Cuss's feet and appeared on Sue's feet, who explained that apparently, the sneakers were taken and that Doctor Va-Va-Va-Voom should hit the road. Doctor Va-Va-Va-Voom took his leave but warned that he would get her someday, but maybe not in this story because the artist forgot to draw page six. After Va-Va-Va-Voom left, Youaretoo told Sue that since the cake was gone, she should be on her way. He then explained that the yellowish road would lead her to the fortress of Captain Know-More the Local Know-it-All and that Know-More would help her find her friends. Hours later, when Herbie got stuck in some sort of puddle, Sue freed him and the puddle responded with thanks, revealing itself to be Wreck. Wreck told Sue that he was having trouble keeping himself together and asked if she would drop him off somewhere down the beaten path. Sue happily said that she would do him one better and that she would take Wreck to Captain Know-More with her. Later, Sue and Wreck followed the yellowish road into a cornfield, where they found the flaming man named Jolly, who spontaneously burst into flame where someone said the word "fire." Even later, Sue, Wreck, and Jolly made their way into a swamp, where they met with the rock-skinned behemoth called Thang, who also decided to join them on their quest to find Captain Know-More. The foursome eventually followed the yellowish road to a lake, which they sailed across using some wood as a raft and Wreck as a sail. When Wreck caused Jolly to burst into flames, the raft sped towards Know-More's fortress until it smashed through one of the walls. Upon meeting Captain Know-More, Sue offered her invisible sneakers to him. Know-More was excited and agreed to grant the wishes of those with Sue in exchange for the sneakers. Jolly got the ability to not burst into flames, Thang got moisturizer, and Wreck got...a duck dinner. Know-More then asked what Sue's wishes were and she told him that just wanted to be back with her friends. Know-More obliged and sent her back to scene of the experimental rocket crash. At the crash site, Sue woke up thinking that the Land of Fuzz was just a dream, but then her brother, Johnny showed that due to cosmic radiation, he could burst into flames. In response, Sue let out a blood-curdling scream. Comments: Created by Robert Piotrowski, Rurik Tyler, and Harry Candelario. 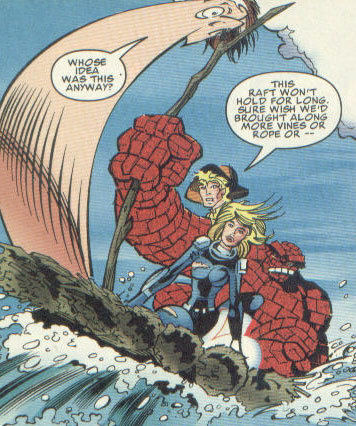 This Earth diverged from the events seen in Fantastic Four I#1 (November, 1961). 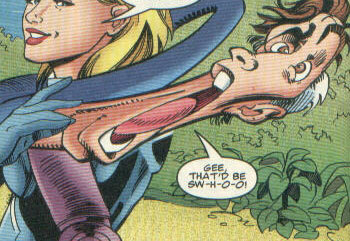 This Earth was officially designated Earth-97102 in the Marvel Encyclopedia Vol. 6: Fantastic Four. Actually, in scanning the issue, I had made a mistaken in ASSuming that the entire FF went to this world, and that they were transformed into oz-like characters. In reviewing this profile, it is clear that only Sue went there (or dreamed she did). However, as all realities (including dreamed, imagined, etc.) exist somewhere in the Multiverse, I'd prefer to think that her mind/spirit did breach the dimensional walls, and somehow gained physical form in this magical realm. Anyway, I had to edit the profile to reflect what was actually going on. 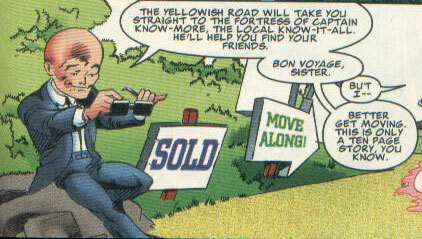 Earth-97102 is the reality that Sue left, while Earth-97103 is the reality to which Sue traveled (Land of Fuzz). Another thing of note: I decided to name the third, female Micro Nut "Mary A. Nette," since I can't think of anything else that rhymes or sounds like Marionette, whom she was obviously based on. Hey! It's not my fault they never named her LOL! Anyone else have a better idea? History: (What If? II#100/2) - When Reed Richards, Sue and Johnny Storm, and Ben Grimm went into outer space on an experimental rocket, Sue Storm was knocked into the side of the rocket and went unconscious. Her mind briefly journeyed to the Land of Fuzz, but she was returned by Captain Know-More. At the crash site, Sue woke up thinking that the Land of Fuzz was just a dream, but then her brother, Johnny showed that due to cosmic radiation, he could burst into flames. In response, Sue let out a blood-curdling scream. Captain Know-More was the local know-it-all of the Land of Fuzz and lived in a giant fortress that was supposed to be impenetrable until the Thang punched his way into the fortress with Sue Storm, Wreck, and Jolly. Know-More was instantly amazed at Sue's invisible sneakers. Sue gladly gave them up and Know-More agreed to give her foursome their greatest wishes in exchange. He gave Jolly the ability to not burst into flames whenever someone mentioned the word "fire," Thang a year's supply of moisturizer, and Wreck a duck dinner. He then snapped his fingers and sent Sue back with her friends at their experimental rocket crash site. His Earth-616 counterpart was Prince Namor, the Sub-Mariner. His Oz counterpart was the Wizard of Oz. 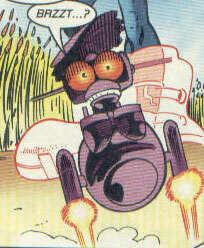 Doctor Va-Va-Va-Voom was Galactic Cuss's cousin who demanded his invisible sneakers when Sue's rocket apparently crashed into Cuss, killing him. Sue informed Va-Va-Va-Voom that the sneakers were taken and told him to leave. Va-Va-Va-Voom announced that she wasn't his master and vowed revenge, although he never got it, because the artist forgot to draw page six. 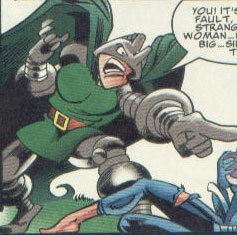 His Earth-616 counterpart was Doctor Doom. His Oz counterpart was the Wicked Witch of the West. Herbie was a small robotic rodent of some sort, being called both a squirrel and hedgehog. It followed Sue Storm throughout her travels in the Land of Fuzz. His Earth-616 counterpart was H.E.R.B.I.E. (but bore a stronger resemblance to H.U.B.E.R.T.). His Oz counterpart was Toto the dog. Jolly was a young man who had been cursed to burst into flames whenever someone mentioned the word "fire." Sue and Wreck met him in cornfield and he agreed to accompany them to Captain Know-More's fortress, where he eventually had his condition cured by the nice Captain in exchange for Sue's invisible sneakers. 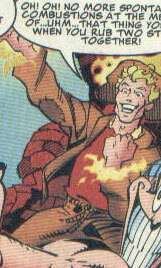 His Earth-616 counterpart was the Johnny Storm, the Human Torch. His Oz counterpart was the Scarecrow. The Micro Nuts were tiny people that lived in the Land of Fuzz. Three were seen, but two of them introduced themselves to Sue Storm as Commander Re-Ran and Chug, who had the distinction of saying "tick-tock" mid-sentence in every sentence he spoke. When Sue asked if they had seen her friends, Re-Ran explained that the Micro Nuts had taken her valuables and hid them far from her reach. The Micro Nuts seen were (from left to right): Commander Re-Ran, Chug, and "Mary A. Nette." 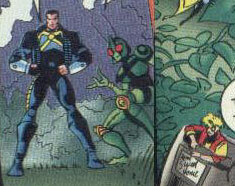 Their Earth-616 counterparts were the Microns (formerly known as the Micronauts): Commander Rann, Bug, and Marionette. Their Oz counterparts were the Munchkins. When Sue Storm joined Reed Richards, Johnny Storm, and Ben Grimm aboard an experimental spacecraft, she was knocked unconscious against a wall of the shuttle. She awoke in the Land of Fuzz and using the invisible sneakers of Galactic Cuss, she journeyed to the fortress of Captain Know-More. Know-More was able to grant her wish to take her back to her friends. She soon woke up next to her friends, but was horrified when her brother Johnny had been granted the ability to burst into flame, like the man she had met in Fuzz named Jolly. Her Oz counterpart was Dorothy Gale. Thang was rocky gentleman who Sue Storm met in the swamps of the Land of Fuzz. He explained to her and her party that he looked the way he did due to a lack of moisturizer. When the foursome finally found Captain Know-More, Thang wished for a year's supply of his favorite moisturizer. 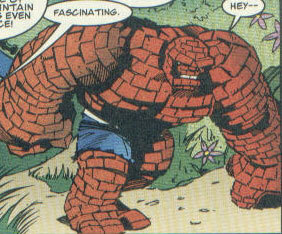 His Earth-616 counterpart was the Thing. His Oz counterpart was the Cowardly Lion. Wreck was man who had trouble holding a specific form, as his body was pliable and elastic. He was constantly changing forms and when he met Captain Know-More, he, for some reason, wished for a duck dinner. Upon seeing everyone else's wishes coming true, he regretted his decision. His Earth-616 counterpart was Reed Richards, Mister Fantastic. His Oz counterpart was the Tin Woodsman. Youaretoo was there when Sue's rocket killed Galactic Cuss and offered her cake with coconut sprinkles. After Doctor Va-Va-Va-Voom arrived and made a scene, he explained to Sue that he was out of cake and that she should be on her way by following the yellowish road to Captain Know-More, the local know-it-all. His Earth-616 counterpart was Uatu the Watcher. His Oz counterpart was Glenda the Good Witch.